It has been said that leaders are always readers. If there’s one activity that most people don’t do much of it, it’s reading books. But books contain lots of valuable information, so it’s a waste not to tap into the wellspring of knowledge that can be found in books. 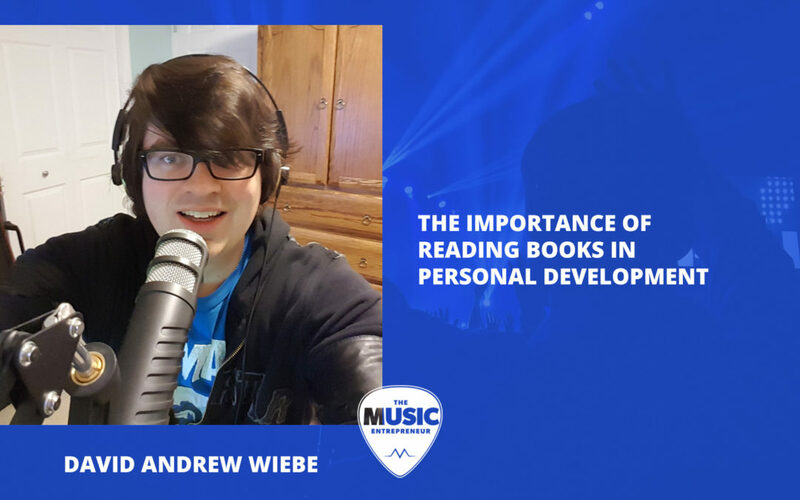 In this episode, I talk about the importance of reading books in connection with personal development. There are really only a few different ways to engage in personal development. In the previous episode of the podcast, I talked about the importance of having mentorship in your life. Reading books is another way to encourage ongoing personal growth. You can also read more about these stats over at a website called Mental Floss. The link will be in the show notes. To me, those are some pretty terrifying stats. But at the same time, this would also suggest that those who make reading a priority are at a distinct advantage. If you’re a music entrepreneur, then reading is probably already a part of your regular routine. But you might be wondering whether you should read books or listen to books. If possible, I would encourage you to do both. But I understand how busy a musician can get, and if you’re constantly on the road, and you have no one to share your driving duties with, reading a book may not even be a logistical possibility. If you’re finding it difficult to find the time or space to read, then it may be worth investing in audiobooks. But you should know that listening is a very different activity than reading, and it’s something I’ll be talking more about in a future episode. Even if you’re someone that has trouble reading, because of dyslexia or lack of practice, I would still encourage you to read. It’s not the speed or quantity of reading that matters – it’s the quality of reading and absorbing of information that’s really going to change your life and career. So what is the benefit of reading? The example I gave in my book was that by reading about a specific topic for 30 minutes every single day, you could become an expert in your field. I know that there’s a bit of controversy around this idea, but based on the stats I mentioned a little earlier, I don’t think it’s an unreasonable statement. #1 Reading can educate you. Naturally, one of the primary benefits of reading is that you can learn about a variety of different subjects. Personally, I try to read a book per week, but depending on the book, it might take me longer to get through. It might be because I want to really take my time and absorb the information, or it could be because the book is really long. But like I said earlier, it’s not about quantity of reading – it’s about the quality of reading. Ongoing learning is important for a number of reasons I’m going to get into. #2 Reading can energize you. A good book can fire you up. I’ve read at least three books this year that have had a huge impact on me. How about you? Not every book I read is inspirational or motivational. Not every book I read is exciting or inspiring. But it’s worth going through the pile to discover the gems. Great books may challenge you in one way or another, but that’s just a pull to be better, and that’s what personal development is all about. #3 Reading can inspire you. Whether you’re a composer, songwriter or business owner, you need fresh input to stay inspired. If you rely too heavily on the creative wells you’ve been drawing from for years or even decades, eventually they will dry up. And then you’ll start to feel like you’re just rehashing old ideas over and over again, which you probably are. If you want to avoid creative stagnation, you need to read material that challenges your point of view and doesn’t just affirm it. #4 Reading can help you stay sharp. Many people have accepted the idea that your mental faculties deteriorate with age. But I don’t believe that this has to be the case. In fact, I think it’s a tragedy when our elders don’t have the opportunity to pass on their wisdom from a life well lived. I, for one, would love to hear their thoughts – their regrets, their victories, their life lessons, and so on. Regardless, reading is one of many activities that can help you stay sharp. But you might still be wondering exactly what to read. All reading is beneficial, but not all reading is geared towards personal or career growth. So while plunging into your favorite novel is not a bad thing, you’re not necessarily going to find principles and ideas that you can apply to your life. You might recall that I had Bob Baker on the show in episode one. If not, you might want to go back and take a listen to that episode – not to pat myself on the back, but I think it’s a great interview. I’ve prepared a couple of links you can go to find more recommendations. One is at musicent.info/books. That link will take you to my book list on The Music Entrepreneur website. It’s not a comprehensive list of books that I think are great, but there are still quite a few to explore there. The other is at musicent.info/sivers. This link will take you over to Derek Sivers’ book notes. He’s reviewed a ton of books and has even given ratings for all of them. I don’t necessarily agree with all of his choices, but I still find that it’s a really good place to discover some good reads. Have you read any books that have really inspired you? If so, what were they? Do you feel inspired to start reading again? If so, what commitment have you made to reading more? What kind of reading schedule will you put yourself on?